2017 New Orleans Metro EV Fleet Workshop participants gained valuable insight from presentations by the Southeast Louisiana Clean Fuel Partnership, Entergy (a major utility provider in Louisiana), the Port of New Orleans, and Solar Alternatives whose President & Founder is also the creator of Louisiana's electric vehicle community group, EV-LA. 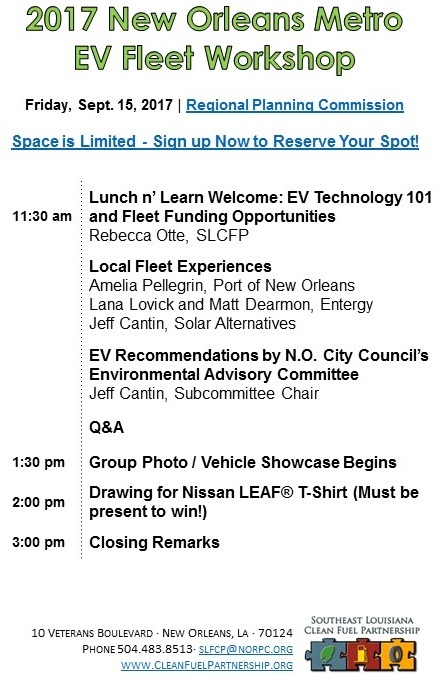 Post-workshop activities included an EV Showcase featuring Entergy's Nissan LEAF and Chevy Volt, Port of New Orleans' Nissan LEAF, Solar Alternatives' Mitsubishi i-MiEV, Limousine Livery's Tesla Model S, Bergeron Volvo's 2018 XC60 T8, and other models provided by our dedicated EV stakeholders! 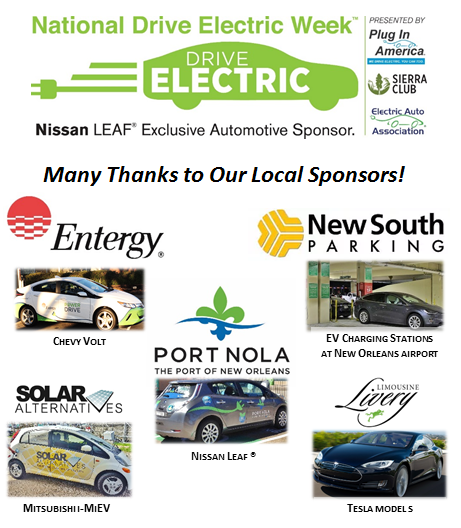 In coordination with National Drive Electric Week and national sponsors Plug In America, Sierra Club, the Electric Auto Association, Nissan LEAF®, and Clipper Creek, the Southeast Louisiana Clean Fuel Partnership (SLCFP) will be hosting a FREE EV Fleet Workshop to inform fleets how to successfully deploy electric vehicles and charging infrastructure into their operations. Planned activities include a Lunch n’ Learn on EV Technologies, Local Fleet Experiences & Funding Opportunities, Exhibits, Free Giveaways, plus a Vehicle Showcase featuring EVs commonly used in commercial and private fleets! Registered attendees report 196,940 electric miles driven.